This summer I’m again participating in a fun event called Read Around the World. Already for the third year in a row, throughout the summer bloggers from all corners of the world are sharing their favorite children’s books. If you want to know more about the series check out our Pinterest board and follow the Multicultural Kids Blog Facebook page. 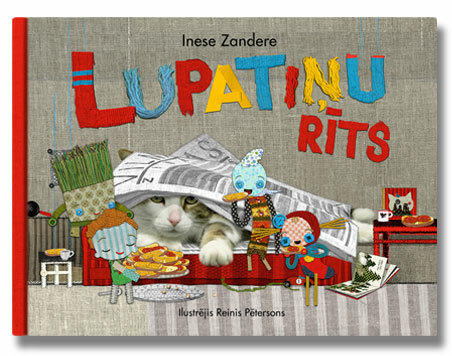 Last year I shared a wonderful baby book from Germany, so this time around let me introduce you to my current favorite Latvian book for preschoolers – Lupatiņu Rīts. Ever since she received it as a Christmas present well over half a year ago, this book has been among Birdy’s favorites and she requests to read it often. The book’s title is translated as “Shammies’ Morning” and it is one of many great books published by the Latvian publishing house Liels un Mazs that specializes in quality children’s literature. The simple-sounding, everyday story is told with a lot of imagination and accompanied by unique, whimsical illustrations. This combination is irresistible for children and adults alike. And, when you close the last page, you are left with the feeling that the makers of this little book love what they are doing and that they have created something one-of-a-kind. Unfortunately the book currently exists only in Latvian but I do have a little something for you English-speakers. The story of the Shammies is a cross-media project, in addition to the book there is also a music CD, and several short films. As the latter have been shown in 40 festivals across the world (and have won a few awards along the way) they are also available in English. Take a few minutes, click ‘play’ on the video below and get to know Sockie, Mitten, Pillow, Hanky and, of course, Mr. Cat! P.S. If you want to see more videos, check out How Shammies Bathed and How Shammies Guessed!